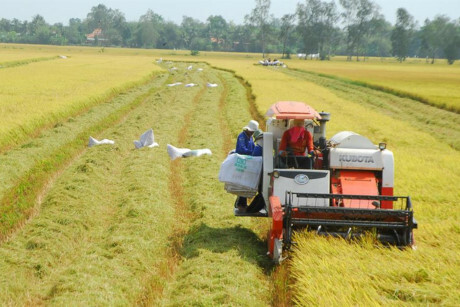 VietNamNet Bridge - Mekong Delta, the rice granary of Vietnam, is facing three big challenges due to the impact of climate change, unsustainable development and hydropower plants on the Mekong River, according to Nguyen Huu Thien, an independent expert on Mekong Delta ecology. Climate change is occurring in Mekong Delta, affecting all aspects of people’s life and production. Rising temperatures, hot weather, unseasonable rain and high frequency of extreme weather conditions are manifestations of climate change. After the big flood in 2011, the Mekong Delta only saw medium and low floods. The extremely low floods occurred in 2015 which then led to the historic drought in the 2016 dry season. Flood came in 2016, but the flood peak was much lower than the average level in many previous years. The water supply for Mekong Delta depends on the water capacity of Mekong with the average flow of 475 billion cubic meters per year. Of this, 16 percent is from China, 2 percent from Myanmar and 82 percent from the Laos-China border down. The rain in Mekong Delta, 1,400-2,000 mm per annum, contributes 11 percent to the water supply to Mekong Delta. The original reason for the drought and saltwater intrusion in Mekong Delta was El Nino, but hydropower has made the situation more serious. Located at the end of Mekong basin, thevMekong Delta has been heavily impacted by hydropower development on the mainstream of the river. The hydropower plants on the Mekong have led to the reduction of fine silt, which causes soil erosion and affects agriculture. The phenomenon causes ‘silt starved water’, leading to river bank and coastal erosion. It also has adverse effects on fishery output in certain areas. According to the Mekong River Commission, the load of fine silt decreased by 50 percent in 1992-2014, from 160 million tons per annum to 85 million tons. The figure does not include sand and gravel components moving in the river bed, estimated at 30 million tons per year. It is projected that once the 11 dams in the downstream area are completed, the amount of fine silt will decrease by another 50 percent to 42 million tons per year. Once the dams are built, sand and gravel from the upstream will be blocked. If so, serious landslides will occur on the Tien & Hau river banks. By that time, 100 percent of white fish, i.e. fish which have to migrate upstream to breed will have disappeared. Of 160 million tons of fine silt Mekong carries every year, 100 million tons of silt and 16,000 tons of nutrition is brought to the Mekong Plume area . Once the volume of silt and nutrition decreases, this will affect local fishery productivity.